From Dogbert, one of Caro’s furry family members in Sparkle Abbey’s Pampered Pets mysteries. It’s Dogbert here. I’m part of Caro Lamont’s fur family and I’ve been worried about my human lately. Caro’s a pet therapist. That means she helps animals who are having problems with their humans. I think she must be pretty good at it because she’s always busy. Also, she’s often involved in some event helping animals and I think that’s a good thing. I mean where would I be if she didn’t have a heart for animals. She got me from the Laguna Beach Animal Shelter after all. She has the pet therapy business, she volunteers at the shelter, and then there are these big events. There was the Fur Ball, which I heard her say was an annual “cough up some cash” to get money for the animal shelter. I’ve coughed up things before, but I have to tell you never any cash. That I know of anyways. Then there was the Fifty Shades of Greyhound event with fifty of that type of dog. They’re really cool. I’ve seen them at the dog park and those puppies are fast. I don’t think anybody coughed up anything at that event, but I heard there was some trouble. 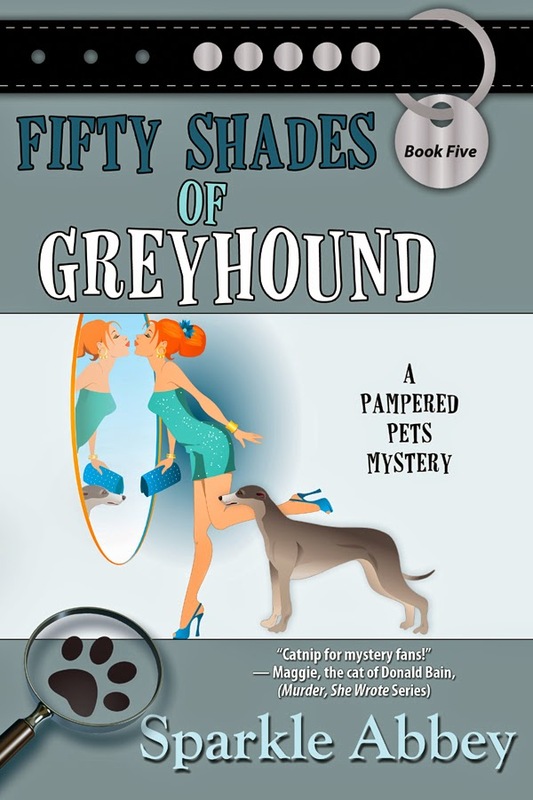 You can read about it the book, Fifty Shades of Greyhound, which is on sale right now for $1.99. It tells about Caro and her and some other people trying to help the dogs. Also, I’m in it too. Okay, I’m back. I had to go bark at someone at the door. It’s my job to do that when Caro isn’t home. When she’s home she frowns at me if I do it. I guess because when she’s home it’s her job. Where was I? Oh, right. This Barking with the Stars thing is to help a group called Warriors for the Paws get more dogs for veterans who have PTSD. I heard Caro explain it's program where military people who’ve had traumatic experiences get therapy dogs. I can see how that would work, can’t you? But I heard her talking to her friend, Diana, and I guess there’s some problem. Not with the dogs, but with one of the famous people. Anyway, do you see a pattern here? I sure do. It seems like every time Caro get involved in one of these events with other people, something bad happens. Maybe she needs to think about the humans she hangs out with. It’s the kind of thing that keeps a dog up at night. I try to help, I watch the cats, Thelma and Louise, for her. I guard the house while she’s gone. When she comes home, I sit on her so she feels safe, and at night, I sleep right in bed with her so nothing bad happens while she’s sleeping. What about you other pets out there? Do your humans do things that worry you? What do you do to help them out? Maybe you can give me some ideas. It was great to bark with you today! Or talk, I mean talk. Soon, you’ll be able to read more about Caro and me in Barking with the Stars. In the meantime, Caro and Mel would like to give you a chance to win one of the books about them and I get to randomly pick the winner. 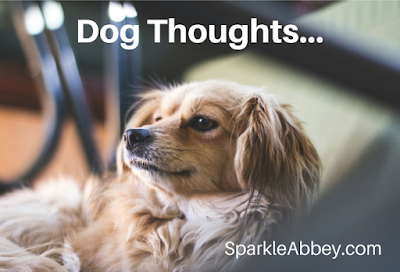 Just leave a comment on the blog before Monday, June 12th at midnight, and you’ll have a chance to win your choice of any of the Sparkle Abbey Pampered Pets books. If you have a pet, I’d love to hear from them, but any comment regarding pets will work too. Until next time, take care of your humans. And humans take care of your pets. Remember, it’s summer and you should never leave us in a hot car or outside in the heat. Sparkle Abbey is actually two people, Mary Lee Woods and Anita Carter, who write the national best-selling Pampered Pets cozy mystery series. They love to hear from readers and would love to connect with you via their website at: sparkleabbey.com or on Facebook or Twitter. Such a cute Cover...thanks for the chance. This sounds like such a terrific series! I love the titles of the books. So clever. Great post! Merrick, my kitty, is feeling a little too shy to comment. She is, however, snuggling on my lap while I type. Both dogs are sleeping but raised their heads to say---PLEASE try to win that book for us Mom. I love my momma and watch out for her all the time. I sleep with her and hug her tight to let her know I'm here for her. She loves to read, and I keep her company sitting with her and looking over her shoulder when she's at the computer. I also watch out for the other cats, even Calumet, the cranky old lady. She's OK with me and the newest addition, Mystic, but she's not fond of Annabella and despises Licorice! I hope momma wins, Love, Mariusz. Sounds like another great series. Thanks for sharing! Sounds like another great series my dog, kitties and I would love to read! Thanks for the chance!! Dogbert, you are awesome. Keep up the god work protecting your human---make sure you like them at least once a day to remind them you are their from them. Loved your post, Caro. Your family is lucky to have you. I have two kittens, Hamilton and Jefferson that take really good care of me. They make life so much fun. Such a great post thank you. Water bowls are a must. This sounds like a fun read. Caro sounds like my toy poodle Lucy. She took very good care of me before she crossed the Rainbow Bridge. Dogbert sounds great. Thank you guys for reminding everyone to never leave their dogs in the car. Thank you so much for the chance to win!! Sounds like a fun read. Added to my TBR. When my service dog passed away, I didn't think I could handle getting another dog. Well I was wrong. I was helping a friend look for a dog and found Tyler. I tried to get info on him, but it was too late. Someone had adopted him. The next week, his photo showed up again. The lady who adopted him had not cleared it with her husband. I got on it right then and Tyler was mine. He is not service dog material, but he is the sweetest most adorable boy I could have ever wanted. I say he is a mix of Rufus (my service dog) and Sammie (my big guy that took care of me for over 21 years). I sure am blessed. Thanks for the chance to win. enjoyed this review!! I have 4 small rescue dogs aka furchildren who I love dearly and I'm fairly certain they feel the same about me. They are such an interesting mix of "personalities"